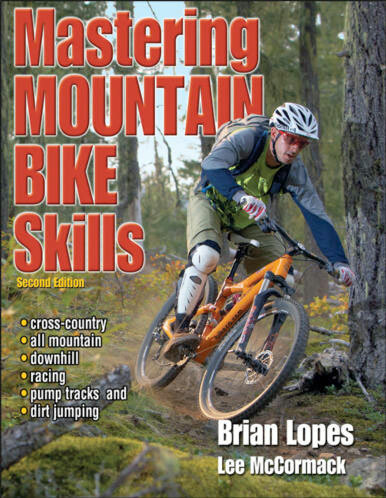 If Mountain Biking The Manual was the starter, Mastering Mountain Bike Skills would be the main course. I re-read this book recently and I think it's fair to say I'd completely forgotten how good it was. As with The Manual, it's jam packed full of incredibly useful information that is very well explained. But importantly, it succeeds where The Manual fails. There are diagrams and photos of everything. Want to know the correct attack position? There's a photo of that. Not sure of the best line to take through a switchback. There's several diagrams for that. Want to know which part of your bum rests on the saddle? There's a diagram for that! It's difficult to overstate how useful diagrams and photos are when trying to visualise an unfamiliar technique, and for me visualisation is one of the best ways to start the learning process. What topics are covered? As with the Manual all the basics are there. Attack position, braking, cornering, flow, jumps, drops, pumping, bike setup, the list goes on. Certainly everything I want to know is clearly explained with a bunch of diagrams/photos. I had several eureka moments when reading MMBS. "Oh right, so that's how you're supposed to do it! ", "Ahhh so that's why pumping makes you faster!" If you had been in a room with me you would have seen a lightbulb appear above my head, on more than one occasion. In addition, at the end of each chapter is a troubleshooting section. Common problems and the solutions. Really really useful stuff. "Push back until your arms straighten or your bum gets the knobby treatment." "If a unicorn suddenly appears if your corner, first straighten out; then brake hard. If you've been practicing your braking skills, you'll be under control before you strike the magical beast." "Explosively push your torso upward and backward with your arms. At the same time, uncork a powerful pedal stroke. If you are nice to puppies your front wheel will pop up." To summarise; great explanations, lots of diagrams, buy it now.